Thanksgiving is almost here... one of my favorite holidays. Our Thanksgiving holidays are spent each year with my in-laws, out at the family "farm" in Alabama. 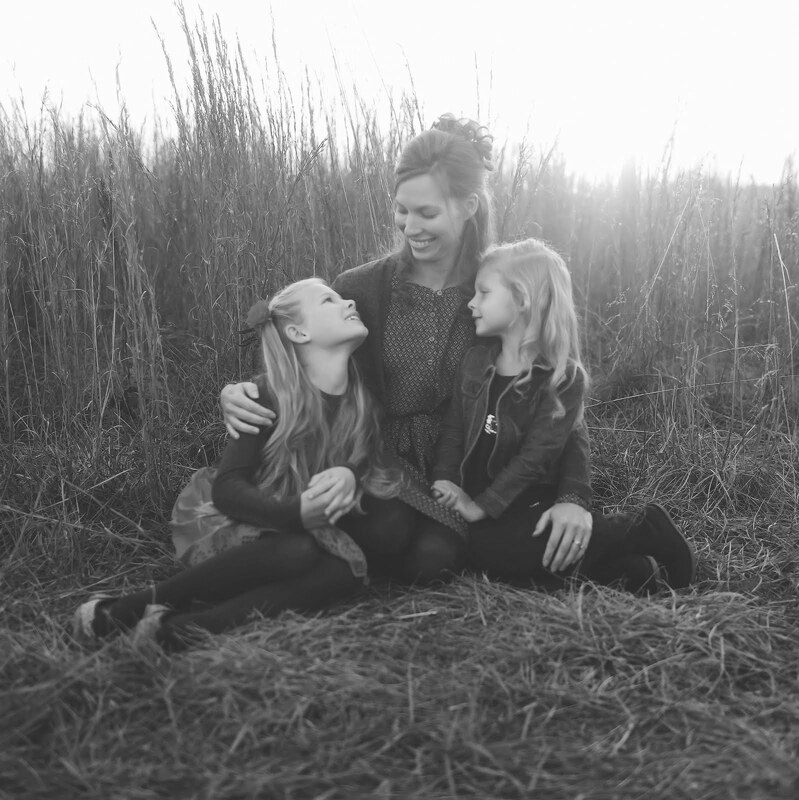 It's a large southern gathering where the family all contributes towards the meal and there's a lot of hugs, laughter, and everything that comes with family spending time together. This year I'm making cranberry sauce (this recipe is my favorite), sweet potato casserole and maybe a chocolate pie. Since my family moved here, they also spend Thanksgiving holiday with us and my in-laws and this year our special friends we have visiting will be joining us all too. I'm so thankful we can all be together on such a special day. Anyway, obviously I won't be setting a Thanksgiving table this year, but I think that if I was, it might look something like this (smile). This fall I've loved all these neutral tones and warm textures. I dug out my craft box to stamp a simple tag to hang on a pinecone (spray painted lightly with gold glitter). It's been a while since I've done a simple little craft and it was fun, even if it did take less than five minutes. The girls had even more fun making their own "name tags" too! This week we've been reading every Thanksgiving book we have... anticipating the upcoming holiday and the new memories made. I hope you have a wonderful Thanksgiving! What are your plans for the holiday? One of my favorite things to grow in the garden is carrots. Once the seeds are sown you essentially don't have to give the carrots another thought. The carrots keep so well in the dirt... just as nature intended. I don't ever worry about harvesting them all at once... I just grab a few here and there as I need them for cooking. But this afternoon was warmer than it has been and Rosetta and I decided it would be a perfect time to get out and dig up several of the carrots for our supper. Although somebody kept getting distracted by feeding and playing with the chickens (smile). The first year we grew carrots and I pulled one out of the ground, I stared at it for a long time wondering why it didn't look like the carrots you buy at the grocery store. Pretty they may not be, but they do taste wonderful and so fresh. These small round carrots are supposed to look like this, believe it or not. The (heirloom) seed company included a free packet and I believe they are called Parisienne carrots. My very favorite way to eat vegetables, particularly in the fall and winter, is by roasting them in the oven. You likely may already roast your vegetables, but I only learned how to roast vegetables in the past few years and I certainly consider it one of the easiest and most delicious ways to cook veggies. We rarely have any remaining after the meal! In the case of carrots, I've roasted them whole, but I actually prefer chopped. You may prefer yours cut differently, but I like the way they evenly cook and get very tender when they are chopped. Preheat the oven to 425 degrees. Once the vegetables are cut, I put them in a pan or a baking dish. I like them to lay in a single layer so that they all cook evenly. In this case, I put the carrots in a 9x18 baking dish. Then I simply coat the veggies in extra virgin olive oil (for the carrots I used about 3 Tbsp) and sprinkle with salt and pepper to taste and some fresh or dried herbs. Sometimes I'll experiment with different flavors, but for the most part I just use those few simple ingredients. Then I put the vegetables in the oven and roast until they are finished. You will know how you like them... whether it's a little crisp or plenty tender and even a little browned (like us). I cooked these carrots for about 45 minutes, but I keep an eye on them and stir about every 15 minutes. The carrots from our garden taste a little different than store-bought as well... the flavor is much stronger and even a little earthy. The carrots are a wonderful late fall garden treat and I love the fact that my girls (and even myself) are learning a little of where our food comes from. P.S. When roasting vegetables, I typically use more than just one veggie... usually it's a process of gathering what I have and combining everything. Onions, squash, potatoes, carrots, green beans, okra... use what you have and it will be a perfect side dish no matter the occasion! The past couple weeks have been a whirlwind of activity and now I can hardly believe we're already into the second week of November. I thought I'd better do a quick catch up post, just on the off chance anybody noticed I've been a bit absent (smile). My grandparents have been visiting all the way from New Mexico for the past week and we've had so much fun together. They leave tomorrow and I know we'll all shed some tears. Below is a picture of my grandma and I taken today at a visit to the mill where we enjoyed perfect fall weather. In house news, we've completely and finally finished our kitchen! The first picture above is a little peek of the new reclaimed wood shelf Justus built for a wall in the kitchen. I'll be back in a day or two with pictures to share of the entire kitchen! Now that we've finished the kitchen, we're also finishing up a little remodel in our bathroom. Justus installed a new ceiling and now he's finishing up installing the beadboard walls. It feels so good to get some house projects checked off! I was a little remiss in posting the winner of the Bee Lovely Botanicals giveaway, but I did draw a random winner, which was Cinnamon. Thank you all for entering! I also wanted to mention that the November/December (Holiday) issue of Celebrating Everyday Life is out and it's beautiful as always. 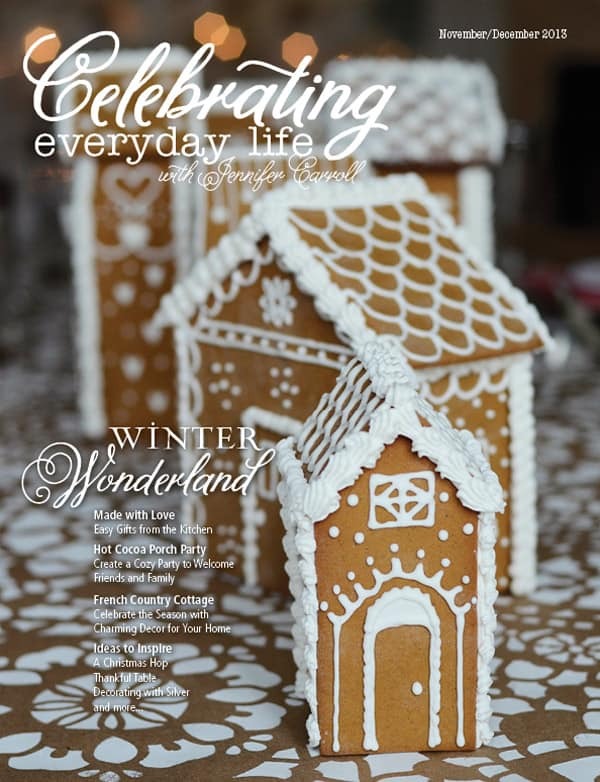 In this issue, you'll find a Hot Cocoa Porch Party, a Gingerbread Wonderland, fun & festive DIY projects, beautiful homes, delicious recipes and much more! For more information or to purchase, you can visit here. I hope you all are enjoying your November so far. I'm already looking forward to the upcoming holidays, especially time with friends and family.